i'm screwing down plywood decking in my boat using aluminum self-drilling screws. they don't seem to tighten down very well. as soon as the screw head hits the wood, the screws loosen.will not pull down. the screws have very fine thread. well, since you asked, - yes - too fine of a thread to hold fast in the bracing..
your options are: find a more pronounced thread fastener. 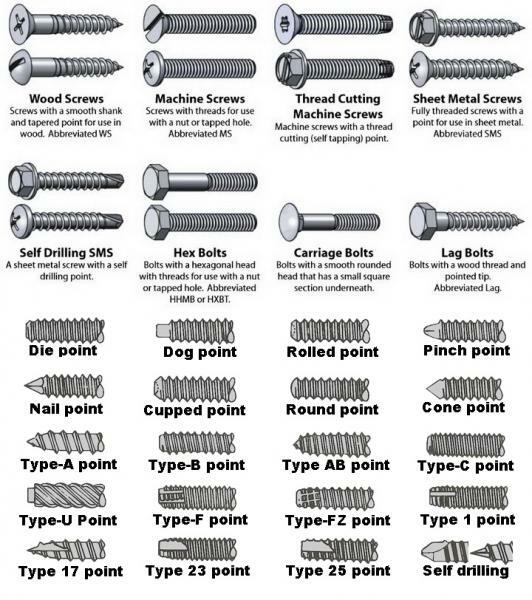 same with drywall screws - there are fine thread and coarse thread screws. the fine thread will not hold nearly as well as the coarse thread. What I used was flat head stainless sheet metal screws...... no worries. available at http://www.BoltDepot.com or your Big Box Hardware Stores. 18-8 x 1-1/4" 316 Stainless Steel. the ones that are not self-tapping - pilot holes must be drilled. a little more time consuming, but, are worth the extra trouble. If you prefer the self tapping, they are available (for a little more $$). Question: you said you were using aluminum self-drilling screws. are the screws actually aluminum ? such as gutter downspouts, PVC fence, etc. Last edited by Johnny on 22 Jan 2017, 18:36, edited 1 time in total. Um, Randyo3649, you are holding the plywood against the AL, right? If so, the threads don't need to hold in the wood - it's the head that holds the wood down. The screw's thread is what is pulling the AL up. How thick is the AL you are fastening to? If it's a thwart, it might be pretty thin. That means they will be easy to strip. You can either drill undersize pilot holes or finish driving the screws by hand JUST until the ply is brought down. I'm with Johnny. A little more clarification? Are the screws themselves aluminum? Are you screwing down a plywood plank to the aluminum in the boat or to another piece of wood? You say when the head touches the wood it loosens? As for screws I would be using stainless steel instead of aluminum if that is the case. Stainless is much stronger and more ideal for marine environments in my opinion. If screwing a plank down you may want to pre-drill the plank first. That way there will not be as much resistance in the screw before it gets to the the base layer you are actually attaching it to. You don't have to make the hole so big that the screw is loose in it but just a little snug to help keep water from getting between the screw shank and the plank you are screwing down. If there is a void, water will find it. I like the shank length to be just a little shorter than the plank you are screwing down. If you are screwing into aluminum and not using self-tapping screws you will need to drill a small hole in the aluminum base plate to get the threads started. If you are screwing into wood it still helps to have a very small pilot hole in it help keep it from cracking and splitting the wood in my opinion. As for self drilling screws I have come across instances of the drilling action being too slow to advance and stripping the area where the threads are supposed grip the material with the threads of the screw. This is another reason to pre-drill the hole you are actually screwing into. I profoundly disagree !!!!!!!!!!! The threads is what holds something to the metal. that small area of metal is the anchor - not the wood. If the substrate is wood, then you would use the appropriate wood fastener. if the substrate is metal, then you use the appropriate metal fastener of your choice. machine screws have a fine thread, designed for thicker material. Bottom line is, do your research and see what method will best work for you. I predrilled the wood decking and then used a drill to start the screw into the aluminum but I then would hand tighten them down in the wood, as mentioned above, very easy to strip aluminum bracing. I have found that even a plain sheet metal SS screw will self tap into the aluminum with a little pressure, no need for a self tapping screw. But if you drill a small starter hole it is a lot easier to get the screw started.